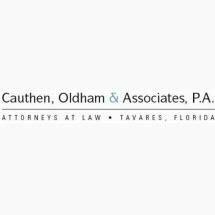 Cauthen, Oldham, & Associates, P.A., has assisted clients throughout Florida since 1972. The firm is strongly dedicated to the community and to achievement of a favorable outcome for each client whenever possible. Attorney Cauthen carefully considers in every situation how best to bring about effective and economical resolution of a client's legal issues. The law firm has significant trial experience in Florida courts and has many demonstrated successes protecting the rights of clients through civil litigation. Whether you need legal assistance with divorce mediation, the collection of a debt, or an impending foreclosure, Cauthen, Oldham, & Associates, P.A., in Tavares, is readily able to handle your pressing legal matter. The law firm is committed to helping you work toward achieving your ultimate objectives. The firm approaches each case with compassion as well as careful legal analysis. Clients report appreciation for honest and personable treatment.